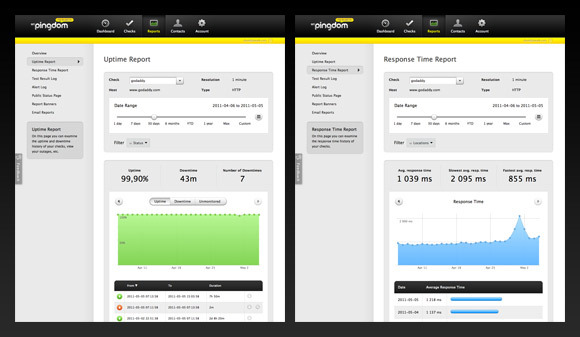 We just launched a sneak preview of a brand new Pingdom control panel, your interface to the Pingdom uptime monitoring service. We’re calling it My Pingdom. It’s a work in progress and currently only the reports section is available for your perusal, but we wanted to get it out there so we could start getting feedback from you, our great users. Your feedback will help us make this new control panel as good as it can be. To try it out, just log in to the regular Pingdom control panel. There you’ll find a link to the preview, at the bottom of the menu. For feedback, there is a feedback widget right inside the new control panel specifically for this purpose, provided by UserVoice. The idea is that this should make it easier for you to contribute ideas, and for us to evaluate the feedback. A win-win scenario, in other words. It’s built on top of our new REST API. This is meant as a clean start, which we will then build upon and add new functionality to. The whole design is quite different from the old control panel, and we’ve even renamed a few things. Hopefully you won’t find the changes too confusing. We’re still tweaking things, but don’t hesitate to let us know what you like and don’t like. We should point out again that this preview only includes the reports section, i.e. things like uptime reports, response time reports, etc. The final version will have a different start page, a dashboard that will act as a starting hub when you log in, and of course the other administrative pages for managing settings and contacts. So, what are you waiting for? Go check it out. And please, please use the feedback widget. 😉 We’re trying to be organized. Ser ju riktigt bra ut..
Kommer ni lägga till pdf/csv nerladdnings funktion? @Yocke: För rapporterna menar du? Någon form av exportering kommer definitivt att finnas så småningom, men blir kanske inte med från början.